October is Health Literacy Month – a perfect time to take on the challenge of raising awareness in your library, organization or community. Many of our professional organizations and government agencies have promotional materials and health literacy toolkits to make this easy to accomplish. Are you up for the challenge? 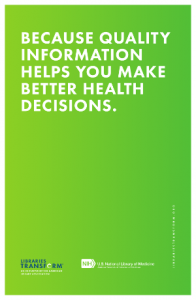 You can start with the free messaging, promotional ideas, and graphics in the Libraries Transform Health Literacy Toolkit. The National Network of Libraries of Medicine (NNLM) and The American Library Association (ALA) have partnered through the Libraries Transform public awareness campaign to create this toolkit for Health Literacy Month. The toolkit provides key messages, program ideas and downloadable marketing materials, including bookmark templates and social media graphics, for libraries to use as they promote health literacy in October and throughout the year. The wide-ranging array of health literacy topics covered include nutrition, aging, and chronic illness. These tools will help you to raise awareness of how libraries support health literacy in your community. NNLM MAR member organizations can order 1 copy of each poster (9 in total) from us, for free. NNLM and ALA will add more statements to the toolkit in the next couple of months – stay tuned for announcements in MAR Weekly Postings. 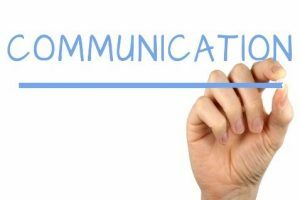 Raise awareness of one particular health literacy barrier, poor communication, by promoting good communication in your organization. Title V of the Patient Protection and Affordable Care Act (ACA) defines health literacy as “the degree to which an individual has the capacity to obtain, communicate, process, and understand health information and services in order to make appropriate health decisions.” George Bernard Shaw said, “The single biggest problem in communication is the illusion that it has occurred.” Just because you said or wrote something you cannot assume that others understand what you are trying to say. A key to taking an active role in one’s healthcare is to establish a two-way communication where both the patient and the healthcare provider try understanding each other. The CDC has developed guidance and tools to help you become a better communicator whether it is verbally or through the health information that you develop. You want to communicate health information in a way that is accurate, accessible and easy to understand. During October, Health Literacy Innovations offers a free webinar series with topics ranging from an introduction to health literacy and the Plain Language & Health Literacy Resource Guide, Informed Consent – It’s Not A Signature on a Form to Advancing Health Literacy in Your Organization. Helen Osborne, a well-known and well-respected professional in the health literacy field has a variety of tools on her website including a handbook for event planning to make you successful in raising health literacy awareness for Health Literacy Month. I hope you will accept my challenge to raise awareness of health literacy in your library, institution or community. Please share your success stories or activities with me, mburda@pitt.edu. I want to hear from you. 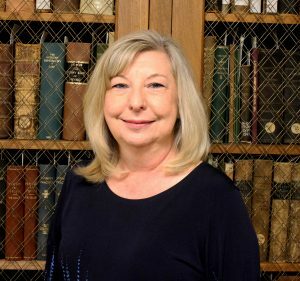 Written by Michelle Burda, Education & Health Literacy Coordinator, for the Summer/Fall 2018 edition of The MAReport quarterly newsletter.